Southeast Asian modern and contemporary art performed very well at Christie's, bringing in $5.7 million with 92% sold. The top lot was by Italian painter-traveler Romualdo Locatelli -Young Balinese Girl with Hibiscus, which broke all previous records, sold for $773,000. An extremely rare and early Fernando Cueto Amorsolo painting, Lavenderas, sold for $434,000), a new world auction record for the artist. Indonesian auction darling I Nyoman Masriadi had 3 paintings in the top 10 lots, but selling for significantly less ($264,500 and below) than his hay days, prior to the financial crisis. Interestingly, two fairly new comers, Indonesian artist Handiwirman Saputra and Filipino Geraldine Javier (photo), achieved world records. 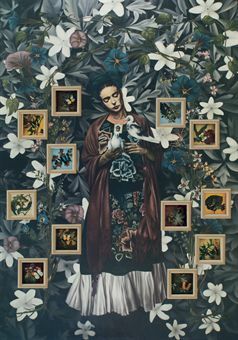 Javier’s Ella amo' apasionadamente y fue correspondida (For she loved fiercely, and she is well-loved) sold for $187,464, nearly ten times its estimate.